Microsoft (and its business partners) wishes to reject or ignore all arguments that the “XML” in OOXML demonstrates a truly abysmal use and implementation of the principles and raison d’être of XML. See our notes on the choice of the name "Open XML" and ECMA's refusal to make amendments which prevent confusion. “Microsoft (via its proxy, ECMA) wishes people to believe that OOXML is no longer application- and platform-dependent…”Microsoft (via its proxy, ECMA) wishes people to believe that OOXML is no longer application- and platform-dependent and that OOXML is interoperable. Not quite so! Not so fast! So say a couple of new articles, one of which comes from the former manager of Microsoft’s Excel and the other from an XML expert. Remind yourself of what was said yesterday and the day before that about the incompleteness of Microsoft’s Office binary format and also about their purpose. Now, consider the words of Joel Sposky, who knows Microsoft’s technology quite intimately because he worked as a senior there before going more solo. They [binary Office formats] were not designed with interoperability in mind. The assumption, and a fairly reasonable one at the time, was that the Word file format only had to be read and written by Word. That means that whenever a programmer on the Word team had to make a decision about how to change the file format, the only thing they cared about was (a) what was fast and (b) what took the fewest lines of code in the Word code base. They have to reflect all the complexity of the applications. Every checkbox, every formatting option, and every feature in Microsoft Office has to be represented in file formats somewhere. That checkbox in Word’s paragraph menu called “Keep With Next” that causes a paragraph to be moved to the next page if necessary so that it’s on the same page as the paragraph after it? That has to be in the file format. If Microsoft wants OOXML to be taken seriously as a proposal for a document standard, only one option is on the table. Rather than try to develop a specification with every possible feature of any version of Microsoft Office, every flag or quirk that some document might use, focus on building a smaller, leaner, interchange format which provides core functionality in a fully-described and implementable fashion. Don’t expose implementation quirks, such as Excel® calculation chains, to people who just want to copy a spreadsheet’s data and formulas. Don’t expose, or even refer to, the details of the VML library, or the DrawingML library, or anything like that; instead, provide a brand new, open, and completely specified, description of the data. When I wrote the Standards & Specs piece on XML some time back, I made an offhand reference to the notion of an XML format containing “<bytes>ff ff 00 03 [. . .]</bytes>”. When I wrote it, I thought I was joking. I guess I wasn’t. As for the JOS article, actually the real message is that it will take at least ten years for someone starting now to implement something comparable to Microsoft Excel (and that’s just one of the three main applications). Where JOS is incredibly clever is that, while his article makes references to the binary formats, which may make you think he’s only talking about the binary formats, the many years of work actually apply equally well for the new Office 2007 file formats (I don’t say OOXML, since OOXML does not exist). 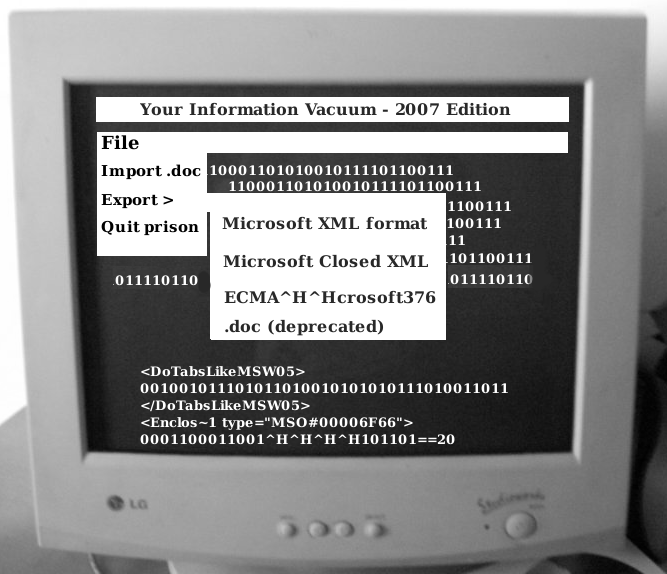 What I find interesting in all this discussion about “OOXML” is that Microsoft will be discussing their specs at the end of the month in Geneva, exactly when Office 2009 beta 1 gets released (I am actually even surprised this has not been released already, I guess Microsoft intentionally blocks it until the BRM). See, the label “beta” means something. It means “feature complete”. So Microsoft knows very well what the changes they have made in the next version of Office, and yet they’ll play innocent and naive with the national bodies. Office 2009, what to expect : the removal of VML, integration scenarios with servers such as Sharepoint. A good thing, but Microsoft can simply create a DrawingML namespace and stuff all the VML crap in it, hoping that they won’t be seen (just like when they want to edit Wikipedia without being seen). After all, they are known for playing dirty. Have you spotted any personal smears directed against you? I ask this for a reason. I’ve seen some smears against you in USENET also. I’ve seen nothing worth discussing. All I’ve seen is Microsoft agents (Novell employees such as Miguel) making hypocrit remarks. Well, I’ve seen attacks on your credibility, which brought back to memory the smear campaign against Peter Quinn. This was never retracted in public and I will write about this when I find the time. Andy Updegrove was called “anti-Microsoft” by at least one person. They use labels.